The way Friday night’s game between the Edmonton Oil Kings and Moose Jaw Warriors was scripted had all the makings of a Hollywood hit, and it played out just like one; an intriguing match-up of two teams with similar records, a little bit of bad blood, a shorthanded and power play goal, and not one or two, but three no-goal calls after an official review. 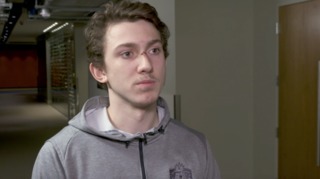 The only thing it was missing was a happy ending for the home team. The Warriors scored three second period goals and never relinquished their lead, skating to a 5-2 win over the Oil Kings in front of 8,422 fans at Rogers Place on Friday night. The game marked the sixth straight road game for Moose Jaw (26-11-6-2), while Edmonton (25-15-4-4) had last seen game action at home on Saturday afternoon. 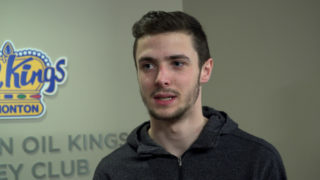 It was an odd game in the sense of the three different goals that were reviewed by officials – two by the Warriors and one by the Oil Kings – and all three being deemed as no-goal. The Warriors twice knocked the puck past goaltender Dylan Myskiw (18-10-2-3) by what was a high sticking motion, while Moose Jaw goaltender Adam Evanoff (13-7-2-1) was ruled to be interfered with in the crease as Andrew Fyten appeared to bring the Oil Kings to within one in the third period. 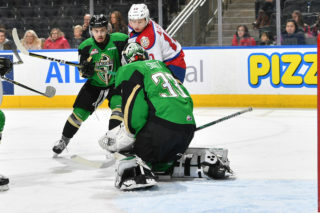 The Oil Kings also hit three goal posts during the game, which eventually saw the team snap a span of five straight games picking up at least a point. Instead it was the Warriors who extended their current streak of games with at least a point to six straight. 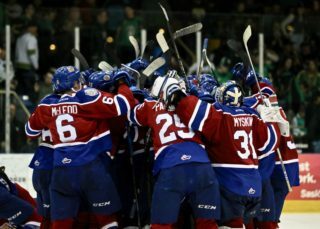 Myskiw surrendered four goals on 24 Warriors shots while Evanoff allowed two goals on 29 Oil Kings shots. Josh Williams gave Edmonton a 1-0 lead with his 11th goal of the season – and first on home ice as an Oil King – from Carter Souch and Liam Keeler at 5:10 of the first period. 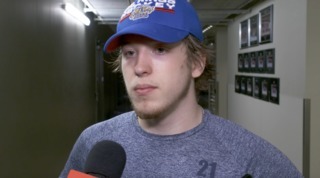 It was the lone goal of the opening frame – which included one of the disallowed Moose Jaw goals late in the period – as the Oil Kings and Warriors were deadlocked in shots, 8-8. Tristin Langan tallied his 38th goal of the season to tie the game, 1-1, at 7:43 of the second period. The goal was unassisted, and propelled Langan past Trey Fix-Wolansky for sole possession of second place in the WHL point scoring race. With the Oil Kings poised to regain the lead with their second power play opportunity of the night, it was instead Justin Almeida who gave the visitors a 2-1 edge with a shorthanded marker, from Jett Woo, at 13:53. 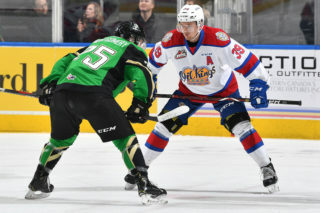 Brayden Tracey gave the Warriors a two-goal lead, 3-1, on the power play at 18:06 but the Oil Kings responded shortly thereafter with Conner McDonald’s 10th of the season, from Williams, at 18:18 to round out second period scoring. Shots on goal in the middle frame favoured the Warriors, 13-10, for a two-period total of 21-18. Luke Ormsby extended the Moose Jaw lead to 4-2 at 9:19 before the game was sealed by an empty net goal during 6-on-4 play by Daniil Stepanov with 29 seconds remaining. Final shots on goal were 29-25, Edmonton. Moose Jaw was 1-for-5 on the power play with a shorthanded goal, while Edmonton finished the night going 0-for-4 with the man advantage. Josh Williams (EDM) (3), Jett Woo (MJ) (2), and Justin Almeida (MJ) (1) were selected as the Three Stars of the Game. The game also served as the team’s annual Pink at the Rink game night in support of amplifying awareness in the fight against cancer. Prior to the game members of both teams, along with fans throughout Rogers Place, held signs of support and/or memorial for those close to them who have been affected by the disease. The Oil Kings are back in action on Sunday, January 27 when they host the Prince George Cougars at 4:00 PM MT at Rogers Place, followed by their third game in five days when the Brandon Wheat Kings come to town on Tuesday, January 29 for a 7:00 PM MT start.